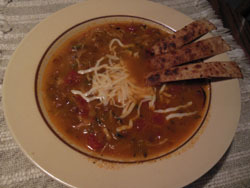 Make this easy soup recipe, Chicken Tortilla Soup Recipe, is sure to please the family. Made with spices to give it a Mexican soup flavor, topping it off with strips of crispy tortillas. Chop onion, celery, garlic and put into soup pot. Wash chicken breast, cut into chunks and put into pot. Cook chicken for few minutes until done. Add tomatoes, broth, beans, lentils, seasoning and bring to a boil. Cook for 20 minutes and add tortilla strips and cook another 10 minutes. Serve with shredded cheese, chopped scallion onion or extra tortilla strips sprinkled on top for garnish.